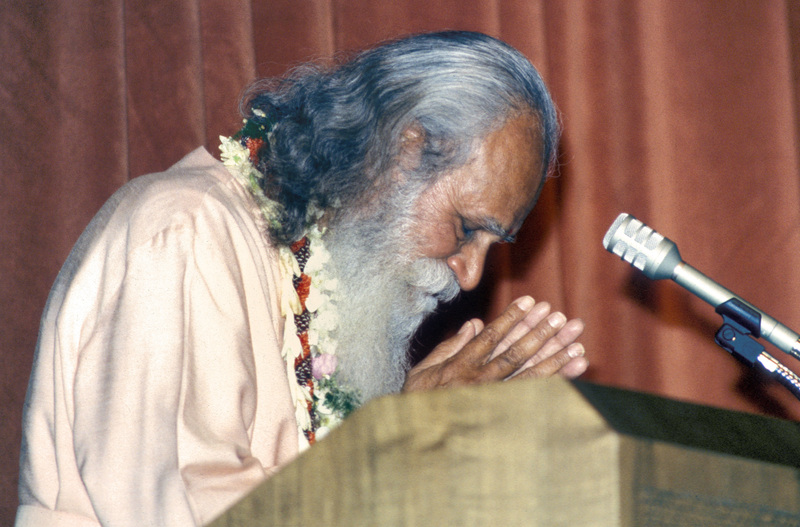 July 1986 also marked the twentieth year of Swami Satchidananda’s service in the West. In a gala program on the evening of the 19th, students and friends paid tribute to this great servant of all humanity. In the International Year of Peace, a beacon of peace, harmony and love was lit in Buckingham, Virginia. On July 20, 1986, the Light Of Truth Universal Shrine (LOTUS) was dedicated and offered to the world. Sri Swami Satchidananda, who had envisioned and designed LOTUS, was joined by spiritual leaders of all faiths and dignitaries from around the globe for the opening services and the World Faiths Symposium on the day before. At the height of the Dedication festivities, approximately 3,000 people gathered at Satchidananda Ashram–Yogaville. Everyone was deeply moved by the experience, and resolved to find ways in their own lives to promote accord among all people. On Sunday morning, LOTUS was sparkling in the sun. Near the shrine’s Grand Archway, thousands of people waited in hushed readiness. Two tigers rested under small canopies; they too seemed to be waiting for something marvelous to happen. Suddenly, from the distance bagpipe music was heard. The parade was coming. Everyone looked up toward the sound. They could see the bagpipe player rounding the bend at the magnificent overlook on the path coming to LOTUS. Next came a beautifully decorated baby elephant. But it was the sight of the celebrants and the blue satin banners with the symbols of the world’s faiths that really stirred people’s hearts. The service allowed everyone to deepen that experience. A simple altar stood in the center of the stage. In the center of the altar was one large candle. The voices of the choir raised once again in song as all the celebrants together reached out with their lighted candles and simultaneously lit the central light. After beautiful words from each of the celebrants the worship service came to an end. As the choir sang Beethoven’s “Ode to Joy,” the celebrants began a stately procession out of the tent and into LOTUS. Along the way, ribbons were cut to open the Grand Archway, the All Faiths Hall and unveil the beautiful statues. Incense was burned. There were prayers and chants in different languages. Lights were waved. Flower petals were offered. The flames in the star-points of the meru were lit by the celebrants. At precisely 12:00 noon, the central column of light went on. From floor to ceiling, this magnificent light shone gloriously. At the top of the dome, it divided into twelve rays which came down to shine on all the altars of all the faiths. Bells rang. Outside, hundreds of multicolored balloons were released to float high and free into the air. What happened next was a spectacular surprise to most of the thousands gathered for the opening. In the procession from the tent to the shrine, each of the celebrants had carried a small pot of holy water from the worship service. At the shrine, they had all poured this water into one large vessel. After the speeches from the balcony, Swami Satchidananda took the large container of holy water and entered the helicopter which had been waiting near LOTUS. The fascinated crowd watched as the craft hovered right over the spire of LOTUS. Swami Satchidananda, holding the vessel of consecrated water-put one foot on the helicopter’s runner and leaned very far out over LOTUS. In a truly magnificent moment, he performed the abishekam (pouring water over something holy, in worship). Loud cheers went up from the crowd, and the cheering continued as Swami Satchidananda, in the helicopter, circled LOTUS three times. In the crowning moment of the whole weekend, which was the crowning achievement of his interfaith work up to that point, it was a perfect visual metaphor for his whole service in this modem world: He is a master who honors the past without clinging to it. He doesn’t hesitate to use technology to extend his service. The point is how he’s taken the essence (which the abishekam is) of ancient teachings and shown how they are totally applicable to our place and time in this seemingly explosive modern century. He seems to say there’s nothing off limits if it’s good and useful. A helicopter is totally appropriate in the midst of a puja (worship service) if it’s the right tool to serve. Fireworks flew up over the spectacularly lit LOTUS—the clear sky, the moon, the bright stars, the lightning—it was just spectacular beyond belief. Finally, the celebrants and other designated people entered the upper shrine. Swami Satchidananda thanked “all my beloved spiritual children who made this a grand success.” But the real thanks, he reminded everyone, went to God, who created LOTUS, made its completion possible, and gave us all an opportunity to be part of it. In a spirit of joyous quiet, everyone walked back toward the front of the shrine. There was a feeling of tremendous good will and love. Visitors from all countries and all walks of life visit daily. Throughout each day people sit in silent meditation and prayer. The Light Of Truth Universal Shrine is open to all. Thank you all my beloved spiritual children who made this a grand success.